WOKING People of Faith have made their stance on the Gaza Strip conflict clear and have pleaded for an end to the violence. Following a Woking Action for Gaza protest in the heart of town last week, WPoF, a group whose aim it is to promote religious and cultural harmony, want leaders to resolve their differences with words, not actions. A statement read: “Members of Woking People of Faith are united in their desire to see an end to all violence, destruction and killing in Gaza. “We believe that every human being is equal in dignity and shares the same basic human rights by virtue of their creation by the one true God. “We believe that people in this region have chosen the wrong path for resolving their disagreements and call upon every individual involved to recognise the dignity and worth of those whom they oppose – and to seek resolution peacefully. 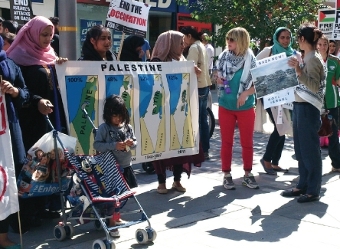 Last Saturday’s rally was held by The West Surrey Palestine Solidarity Campaign and drew more than 120 people into Commercial Way.